So far at EOGB I have learnt the basics of domestic oil heating, how to find faults on domestic oil burners, the basics of commissioning commercial and industrial burners, alongside learning product knowledge from daily communication with colleagues. I have learned the majority of this through various training courses, shadowing Martin or Reece on-site visits, self-study, and most importantly getting hands-on experience-which, in my opinion, is the best way to learn. As a Trainee Technical Engineer, what specific training have you done? Since I’ve started my apprenticeship I have attended a domestic oil burner training course which includes stripping down of burners, identifying components, nozzle sizing, fault finding and complete boiler/burner servicing. I recently attended the commercial burner training at Baltur’s impressive facility in Italy. This was a great opportunity for me to get hands-on experience with different types of commercial burners. This course covers things such as commissioning, gas valve set up, modulating controls and fault finding. The facility allows you to fire the burners continuously, which really helped me as you have more time to adjust the burner and observe the combustion figures. This really helped with my understanding and improved my confidence. 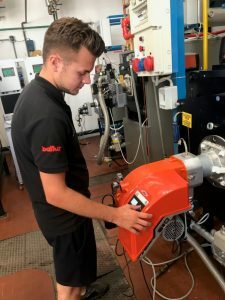 I am currently undertaking my Level 2 NVQ Diploma in Engineering Technical Support, which is built around day to day activities such as design, CAD, Solidworks and manufacturing processes. I enjoy testing new products and technology in our R&D area. In particular, EOGB’s fully modulating blue flame oil burner. I enjoy working on this as it is very different from a standard domestic oil burner as it has its own unique control system and is fully modulating. I enjoy doing projects in our R&D area. Some of these projects include testing different burners at different outputs, and we were recently testing HVO biofuel on some of our burners and comparing results. 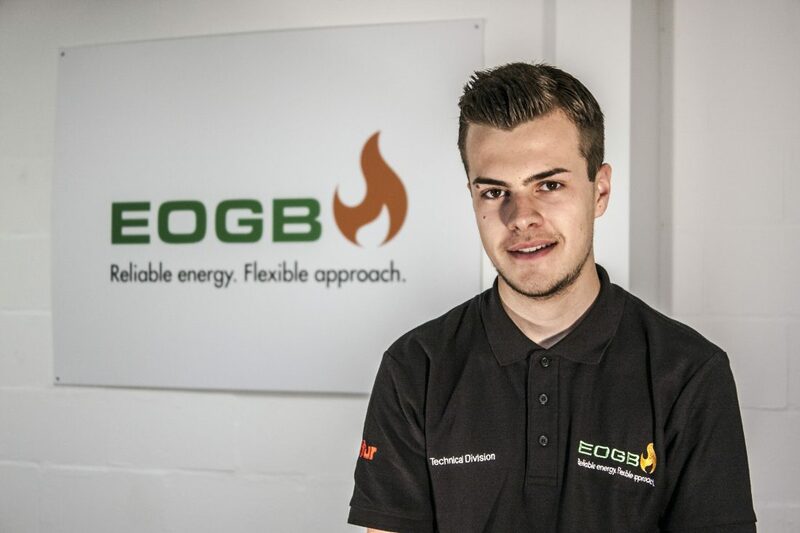 I also enjoy getting on-site experience as it will help me with my development and increases my knowledge and understanding of commercial and industrial heating. On site visits I shadow Martin and Reece so I learn a lot from them, and hopefully soon it will be them shadowing me! Is anything different to what you expected? How friendly and helpful everyone here at EOGB is. I know that if I am ever unsure about something then there will always be someone able to help as the team is very knowledgeable. Soon I will complete the OFTEC 50 course, which is for new entrants to oil. Following that, I will complete the OFTEC 101-105-600 which is a combined training and assessment package. Once I’ve completed my level 2 NVQ, I will move on to a level 3 NVQ in Engineering Technical Support. Following all of this, I will move on to complete all the relevant gas qualifications to become a fully qualified engineer. What is your advice for anyone wanting to take on an apprenticeship? My advice is to be willing to learn, willing to work, and be patient. Attend all the training courses you can and try to get as much ‘hands on’ experience as possible.